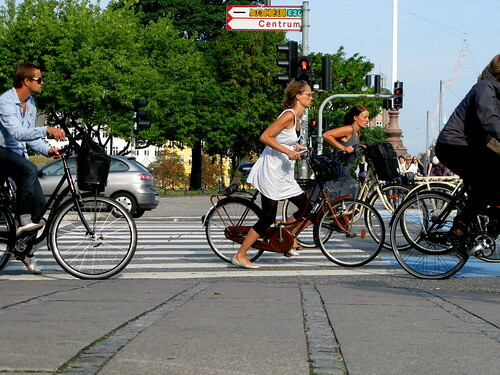 The focus on the cycling life of Denmark in general and Copenhagen in particular came out of nowhere when Copenhagen Cycle Chic and this blog launched a couple of years ago. The international focus on reestablishing the bicycle as a feasible, acceptable and respected transport form has increased steadily and shows no sign of diminishing. The result is that cities, towns, cycling groups and even nations are become hungry to learn about the experience of cycling friendly cities, towns and nations and how they achieved their goals. They are knocking on the doors of Denmark and Holland and arriving on study trips. I've had the pleasure of meeting a few hundred people over the past year or so who have come to Copenhagen to see what we do. We've gone for bike rides around the city or sat in cafés and discussed. For more than a century Denmark has been a country of cyclists. Today, Denmark is a cycling laboratory where new trends and ideas are combined with knowledge gained through years of experience. The Cycling Embassy of Denmark gathers the best information from the private, public and non-profit sectors in an effort to be the primary source of cycling knowledge and products. The embassy comprises experts in city planning, infrastructure, cycling promotion, parking facilities, bicycle tourism, biking equipment and much more. The interest in promoting bicycling in cities around the world is greater than ever. “No other single activity can simultaneously improve general health conditions and fitness, reduce pollution and CO2 emissions and help tackle congestion. That is why countries around the world now want to re-introduce the bicycle as a means of daily transportation” says Lise Bjørg Pedersen, Secretary of the Embassy. They certainly made my life easier during the climate conference by arranging many, many bicycle tours for the armies of journalists and politicians, showing off our infrastructure and facilities. Indeed, the recent Climate Conference was a fantastic springboard for the Cycling Embassy what with the massive amount of visitors to the city. Among other things they awarded Mayor Bloomberg a diploma for his efforts towards establishing New York as a cycling city and they harvested a fantastic amount of contacts and press exposure. All good for promoting cycling and spreading best practice and experience around the world. It is worth noting that the Dutch Fietsberaad [Cycling Council] has a Knowledge Bank on their website for exchanging information and ideas. Definately worth a look.